Where In St Louis Have The Most Sellers Lowered Home Prices? Spring is just around the corner however, as I write this I hate to say there is snow coming down outside my window, and St Louis sellers as well as St Louis REALTORS are anxiously awaiting the increased home buying activity that typically comes in spring. Many people equate the spring market with higher home prices however, there are many St Louis neighborhoods that have seen sellers busy lowering prices in the past 90 days. Perhaps, they were overpriced to start with or perhaps the sellers wish to give themselves a competitive edge going into the spring market, but for whatever the reason, as many as 50% of the sellers have lowered home prices in the last 90 days in some St Louis neighborhoods. 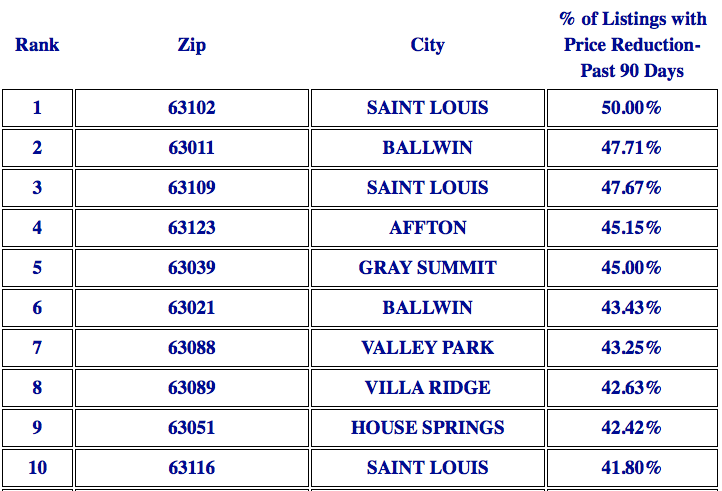 What St Louis Neighborhoods Are Seeing The Most Price Reductions By Sellers?